Michele with a 50 lb juvenile loggerhead sea turtle that she had just carried off the beach. It survived and was later released. The larger, 275 lb female, did not survive. It takes a village — a very big village — to save the Kemp’s ridley sea turtle from extinction. That’s one of the messages in “Saving Sea Turtles: Preventing Extinction,” a new feature-length documentary by filmmakers Michele Gomes and Jenny Ting of Seattle-based Interchange Media. The film chronicles the 2014 sea turtle stranding season, which saw a record 1,242 turtles strand on the beaches of Cape Cod, and the combined efforts of conservationists, biologists, volunteers, members of the National Oceanic and Atmospheric Administration, politicians and the Coast Guard to save the endangered animals. Prescott, who began the Cape Cod sea turtle rescue program 30 years ago, is featured in the film along with members of the sea turtle rescue community in Quincy, Texas, Florida, Georgia and Mexico. “Saving Sea Turtles” focuses on the Kemp’s ridley, the smallest and most endangered sea turtle species in the world. Juveniles range from 12 to 15 inches and weigh between five and 10 lbs., while adults are between two and three feet and can reach 100 pounds, according to flyers at the Wellfleet sanctuary. They feed on crabs, jellyfish and fish and mate in Mexico and Texas. Kemp’s ridley’s biggest threats along the east coasts of Mexico and the United States are habitat loss, becoming entangled in fishing gear, and oil spills. According to the film, prior to the Deepwater Horizon spill in the Gulf of Mexico in April 2010, there was a 12 to 15 percent increase in Kemp’s ridley nesting each year because of conservation efforts. Turtle recovery had researchers thinking that the Kemp’s ridley would be removed from the endangered species list. But after the oil spill, their numbers nosedived back to critical levels. “It will take years to sort out all of the ramifications of what happened to the Gulf of Mexico environment and [the turtles] in the gulf,” Dr. Patrick Burchfield says in the film. He directs the Gladys Porter Zoo in Brownsville, Texas, another member of the sea turtle conservation village and leader of the Bi-National Turtle Conservation Project. 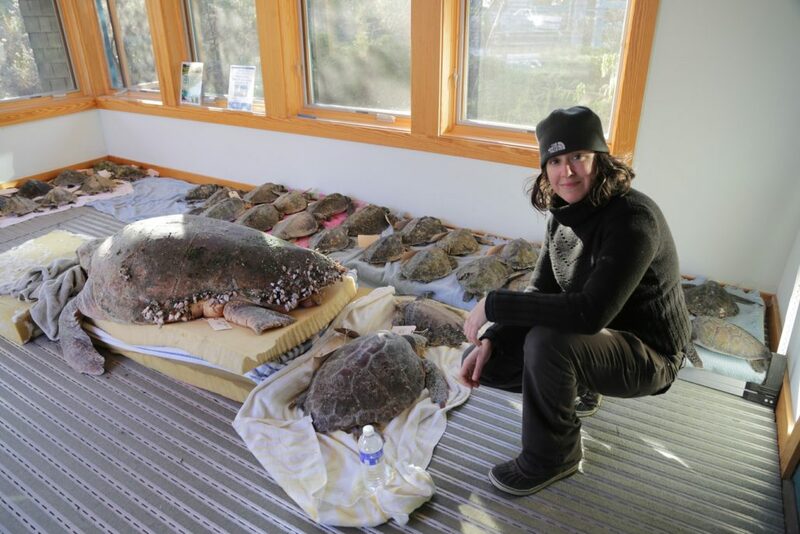 It was during a visit to the Wellfleet Bay Wildlife Sanctuary in 2013 that the filmmakers first heard about the sea turtles stranding. As Gomes and Ting prepared to make their documentary, they happened to run into a friend in Seattle who was connected to the Kemp’s ridley conservation project in Mexico. “We thought we’d be doing a movie about sea turtles on Cape Cod, and then we started following the turtles all the way to Mexico and Texas and then to Georgia and Florida, where the stranded turtles are released,” Ting added. In 2014 the filmmakers rented a place in Truro and stayed for five weeks so, Ting said, they wouldn’t miss a beat of the stranding season. They had no idea that they were going to film the record-breaking stranding season. The 2014 season caught everyone off guard. “It was hard to film at times because you just want to put the camera down and help,” said Ting. Barry and Donna Tompkins, two volunteers assigned to patrol Rock Harbor Beach in Eastham, were on-call day and night during the 2014 season. Great informative article about the filming of Saving Sea Turtles: Preventing Extinction HERE.